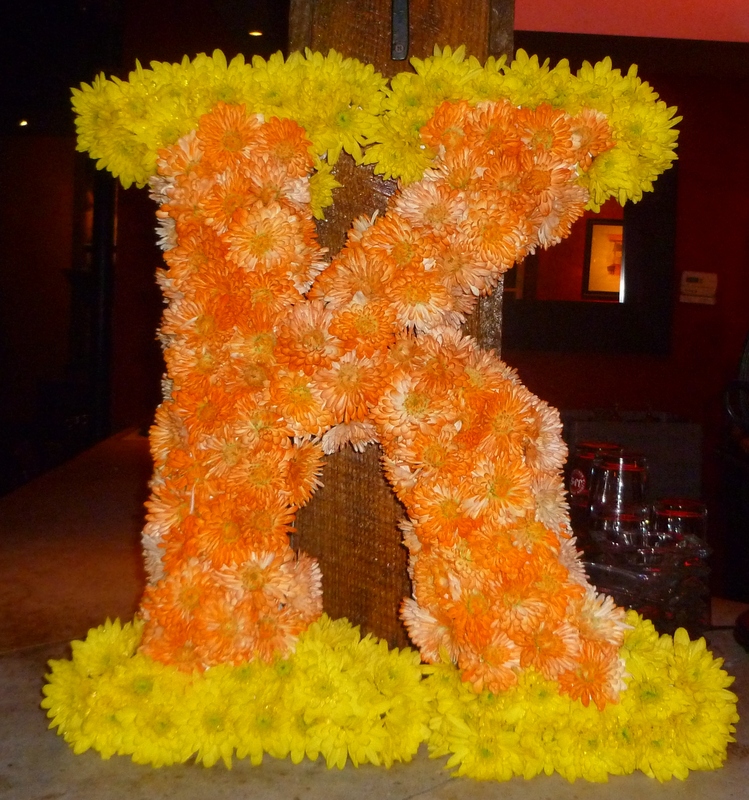 3) Once you know how big your letters will be, measure your chosen flowers to determine how many you will need to fill the template, then add about 10%. DOn’t forget that you will likely be covering the front, sides, bottom and maybe top of the letter, depending on where they will be displayed. My letters were 4 medium mums wide and 2 – 3 mums thick. Hint: remember you can always spray white flowers to your color, if you cannot find what you need in the natural world. 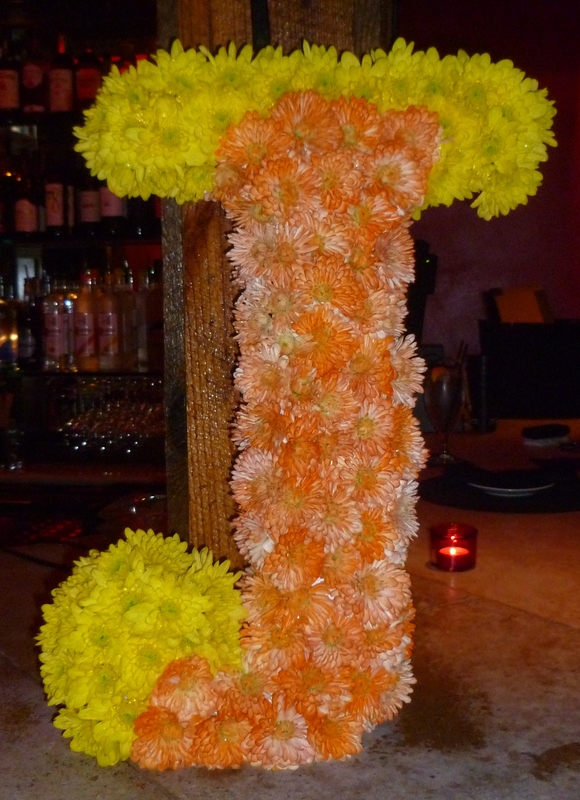 I sprayed some of mine orange, as the bride’s colors were orange and yellow. 4) Get your letter templates printed on large paper at and office supply store or copy shop. I ended up making my cut outs a bit bigger even than the templates. 5) Trace the template on your background and cut out your foam with a sharp knife. 6) I used a pin to make a pilot hole in the styrofoam before I put the flowers in, as the stems were not strong enough to pierce the foam. Some people spray the foam with glue and glue the flowers on, which would have been faster, but, as I said, it had to make it a few days. 7) My letters were pretty heavy when they were finished, which was fine, because they were going to be standing up, not hung on a wall. They would have to have been smaller, or I would have had to use the rough florist foam if they needed to be hung. Final Note: It was a very cool and fun project and it took me about 2 hours per letter once I got the foam cut out. Would defineitly do this again! 10 May	This entry was published on May 10, 2011 at 2:06 pm. It’s filed under Modern, Rehearsal Dinners, Weddings and tagged diy, floral initials, mums. Bookmark the permalink. Follow any comments here with the RSS feed for this post.